Habit: Perennial herb, densely cespitose, generally with short rhizomes, 1.5--7 dm; dioecious. Leaf: sheath open +- 1/3 length; ligule 0.2--18 mm, truncate to acuminate; blade 1--4 mm wide, firm, folded, inrolled, uppermost stem-leaf blade generally +- vestigial, sterile stem blade upper surface generally finely hairy. Inflorescence: generally 2--12 cm, lanceolate to ovate, dense; branches smooth or scabrous. 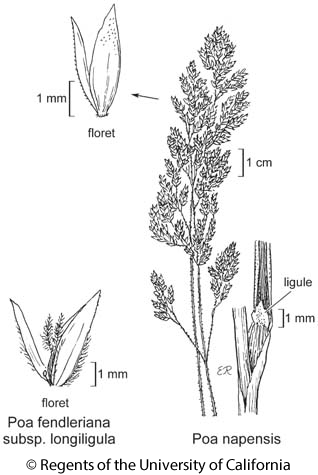 Spikelet: callus glabrous; lemma 3.5--6 mm, keel, marginal veins, sometimes intermediate veins hairy. Flower: unisexual, generally pistillate; fertile anthers 2--4 mm, sterile anthers minute. Leaf: ligule 1--18 mm, truncate to acuminate, margins smooth, glabrous; blade 1.5--4 mm wide. Spikelet: lemma keel and marginal veins (sometimes between) hairy. Chromosomes: 2n=56. Citation for this treatment: Robert J. Soreng 2012, Poa fendleriana subsp. longiligula, in Jepson Flora Project (eds.) Jepson eFlora, http://ucjeps.berkeley.edu/eflora/eflora_display.php?tid=52367, accessed on April 19, 2019. No expert verified images found for Poa fendleriana subsp. longiligula. SNH, SnBr, PR, GB, DMtns; Markers link to CCH specimen records. Yellow markers indicate records that may provide evidence for eFlora range revision or may have georeferencing or identification issues. Purple markers indicate specimens collected from a garden, greenhouse, or other non-wild location.